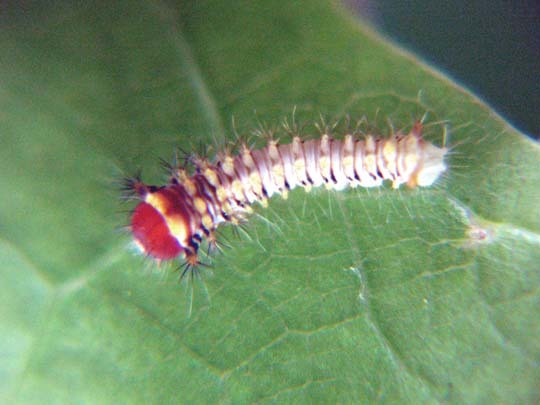 A Bombyx hatchling on the chopped leaves. 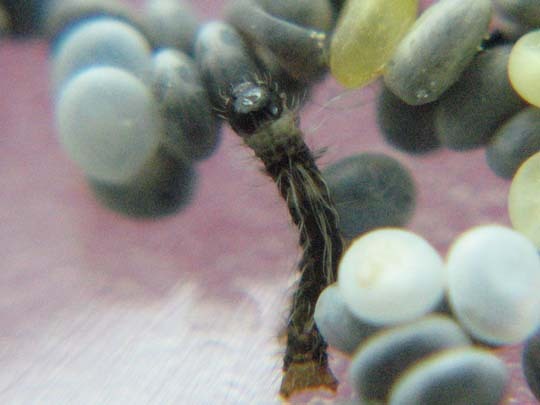 A Bombyx hatchling surrounded by eggs. The white ones are already hatched; the yellow ones were infertile. Some of these, you can see through to the caterpillars. 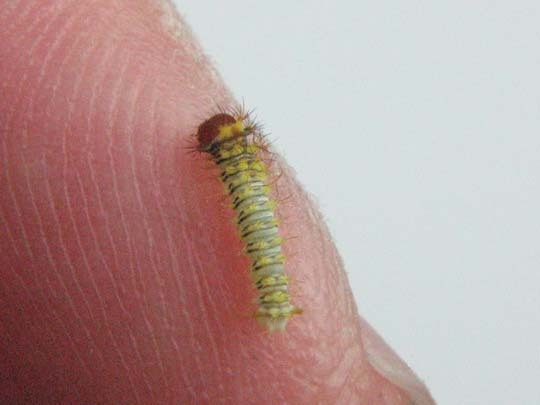 This is a hatchling Polyphemus caterpillar. These are America’s best silk moth, as far as silk goes, in my opinion. Again with the fingertip scale. 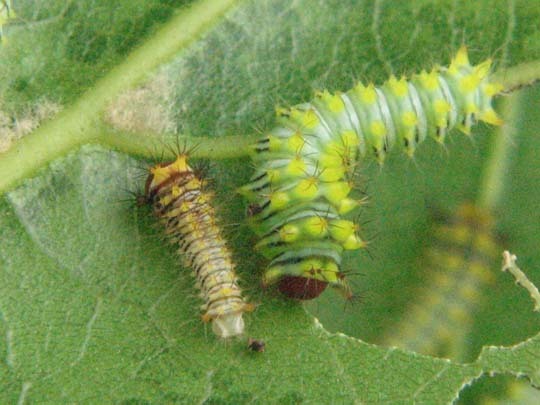 The caterpillar on the right, is about four days old. You can see that they grow very quickly. The clusters of scoli (little hairs) remind me of the spines of cactuses. They grow in the same little clumpy ridges. 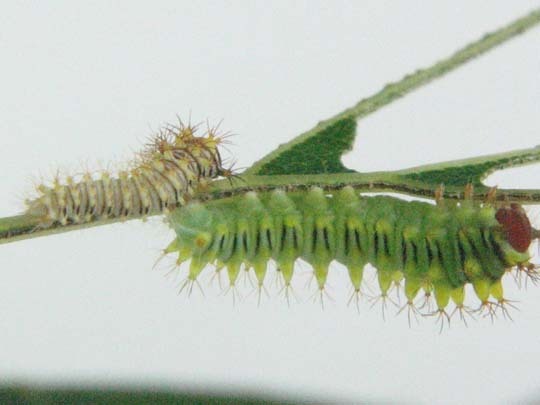 On some caterpillars, the spines are sharp, or even stinging – but these are soft. 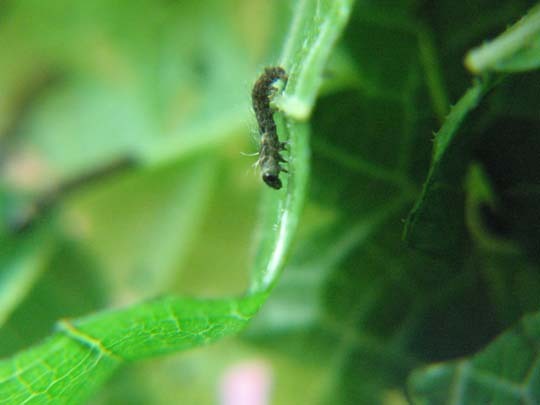 Notably, the faces of these two first-instar caterpillars are the same size. 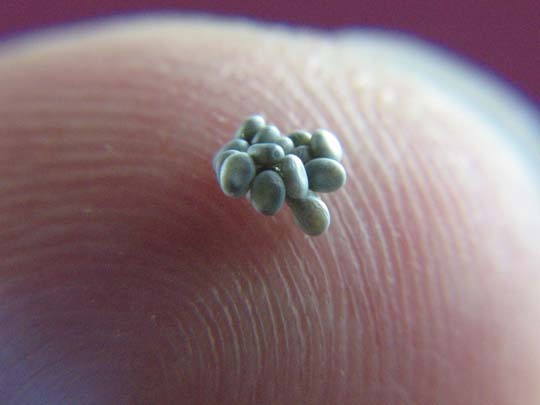 The hatchlings start out looking bizarrely top-heavy, and by the time they grow into their skins, their heads look comically small. Then, they change heads and skins, and start growing again. Ha. I’m scouring the cacti picture trying to find the caterpillar. then I read the caption. ;-j You’re right. that scale is absolutely amazing! How different is the silk produced from one species to the next? I love the sense of massive/tiny. Definitely! That’s just a cool shot. 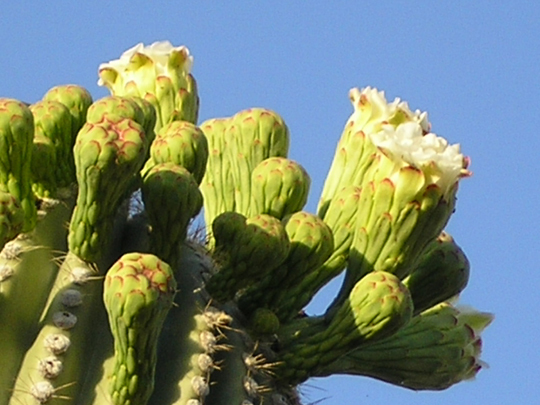 The close up of the scoli looking like a cactus (complete with flowering), is amazing, too. You take the best bug pictures evah! I am trying to figure out how I can get enough mulberry at a time to keep a few. We have a ton of it growing locally, but I just don’t happen to have one in my yard, nor place to grow one. The best are down in Como Park *laugh* but I think the staff their might be a teensy bit annoyed if I went and ravaged their boshes! Wow! You really have the macro down! Thanks for sharing the pictures. They are really cool little critters and the scale is facinating! I scavenge a lot of mine. I have a huge tree, but they’re such a weed here, it’s easy to get lots on roadsides, by railroad tracks, behind stores, etc. Fortunately, the kind of people who let weed trees grow, don’t usually spray! I could scavenge here too, I just need to figure out where from that won’t get a parks dept peeved at me. The one bush behind a friend’s house isn’t quite big enough yet I think… the do eat a fair amount I imagine. Quite a bit. I mean, it’s all silk… but Bombyx is very white, quite fine, and very even; Tussah and its relatives are more tan or golden brown colored, thicker, and a little less even. I love the first pic of the eggs on your finger! What a great shot! Thanks! I have had SO much fun with the macro.